The Buick on the lift and ready for new exhaust. The Buick finally got some new exhaust! It wasn’t without pain though. 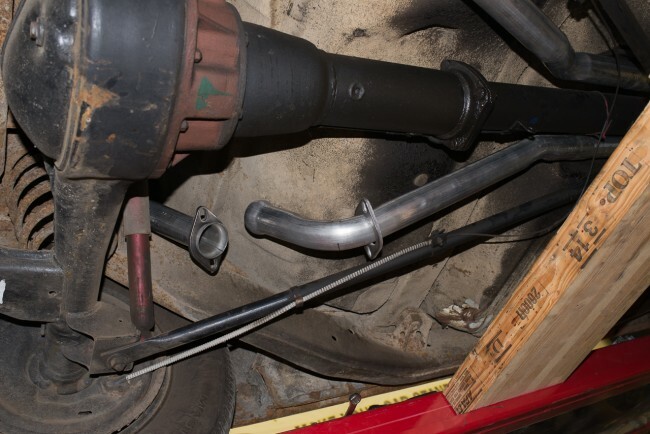 I was the unfortunate buyer of an exhaust kit from a seller on eBay, sat1966, or Classic Car Exhaust Systems, that is offering exhaust kits for just about every vintage car you can imagine. What attracted me was that the kit came with an original style transverse dual inlet/outlet muffler. I bought the kit about 8 months before installing it, so I had no chance of complaining to the seller about any issues that would come up. I can’t blame the seller really, I think they are just a retailer, they probably didn’t make the stuff… but, just beware, don’t buy your Buick exhaust kit from them, it’s junk. Maybe other systems they sell are fine, I don’t know. New Exhaust System from an eBay Seller. So this week, I was able to get the car up on the lift at my dads shop. Dad did most of the work, since he knows what he’s doing when it comes to this sort of project. 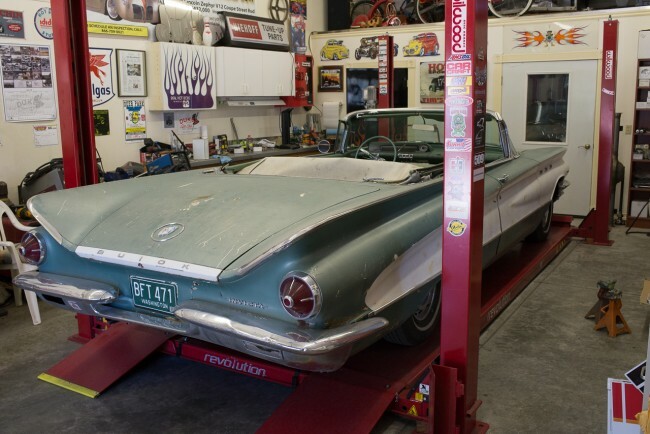 He has many decades of experience as a fabricator and builder of hot-rods and custom cars. Installing this exhaust kit was far from straight-forward, and far from “plug and play”. It required quite a few of the bends to the back half of the system to be adjusted by making pie-cuts and re-welding. I think we probably have a good 8 hours into the project. But, after much trouble, it fits and looks good. The big problem now is that the sound is terrible! The so called “muffler” is nothing more than a metal can with two perforated pipes running through it. Both sides exhaust into the same perforated pipe inside the can, which then feeds through the perforations in the outlet pipe. This is how it worked in the original muffler too, except with this one, the cannister is entirely hollow with no packing or anything else inside. It sounds exactly like you think it would. To quote my dad… “like farting in a barrel”. This is how far off it was on the drivers side! All finished, it looks pretty good. So now what am I going to do about the muffler? It isn’t something you can order from Napa or Rock Auto. 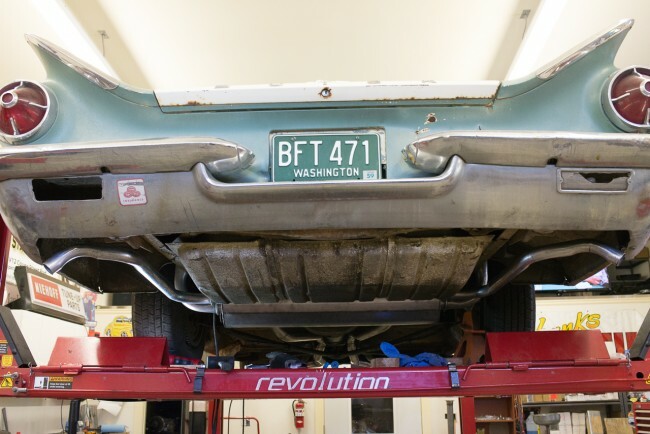 I did some Googling and came across Waldron’s Exhaust, who offers an entire kit for the ’60 Buick that, at least judging by the photos, looks a lot better than the one I ended up with. Here’s a link to their 1960 Buick kit. And the muffler looks like a real muffler! You can even order the muffler in 3 variations, from stock to hotrod. I also did some Googling about this company and found that the they changed ownership at some point after 2008, and have since been a very good and reputable company to deal with. As soon as I can get some measurements from my muffler to make sure the one they are offering is going to fit, I’ll give them a call and ask questions. It looks like I’d ideally need them to make the muffler inlets straight instead of flared… hopefully they can do that for me. A muffler is less than $200, so I guess that’s not too bad. I’d really like to have my car sounding decent, and leaving this crappy eBay muffler on there just isn’t going to cut it! Farting in a barrel – that’s a good one.